The American Heart Association teams up with local farm to table chef and author Budd Cohen to encourage healthy eating for Philadelphians this season! Notorious for our top ranking on the most unhealthy cities list year after year, Philadelphians are really making strides when it comes to healthy cooking and eating. With a much more dramatic focus on farm to table ingredients and eating local and fresh, chefs like Budd Cohen are making a difference! 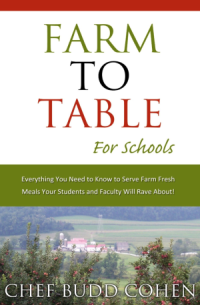 Chef Cohen is the Food Service Director at Philadelphia College of Osteopathic Medicine and author of Farm to Table for Schools: Everything You Need to Know to Serve Farm Fresh Foods Your Students and Faculty Will Rave About. Statistically, more than two-thirds of American adults and one in three children and teens are overweight or obese, putting them at risk for heart disease and stroke, as well as many other chronic illnesses and conditions. AHA’s National Eating Healthy Day offers people across the country, at home, work or in their community an opportunity to make a healthy change in their lifestyle. Chef Budd Cohen will offer healthy cooking demos and samples at the Market & Shops at Comcast Center, 1701 JFK Blvd. at noon on November 4th. Chef Cohen will use local, farm fresh, seasonal ingredients for a tasty heart healthy apple, butternut squash & spelt berry soup with fresh herb foam. Featuring ingredients from Weaver Orchards of Berks County and Castle Valley Mill of Bucks County, Chef Cohen will talk about the importance of healthy cooking and how making significant changes in your diet is crucial to health and wellness – plus mixing it up in the kitchen can be fun!